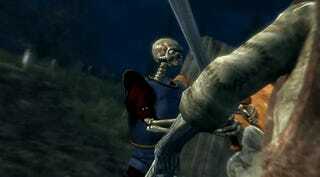 The ever-rising Sir Daniel Fortesque shall live once more, thanks to a mod aimed at recreating the first four levels of the classic MediEvil in The Elder Scrolls V: Skyrim. The mod, crafted lovingly by KorinOo of Nexus Mods (via Reddit), aims to breathee new life (sorry, it's too easy) into a PlayStation mascot that's never been incredibly popular but refuses to fade completely into obscurity. We just can't quit you, Sir Dan. I will say, KorinOo certainly captures the spirit of MediEvil, even if Dan the Man is looking more realistic than he ever has before. Combined with the music of Adam Oakman and the voicework of Cole Johnson, I could almost imagine this was a trailer for a new game.